L’Occitane en Provence has paired up with UNICEF (United Nations Children’s Fund) in an effort to help prevent 1.7 million children from developing avoidable blindness. The World Health Organisation has estimated that “80% of visual impairment can be prevented or cured, and that can start by getting sufficient Vitamin A,” so L’Occitaine is dedicating 100% of its profits from their Shea Butter Soft Soap (50g) to providing Vitamin A supplements to children all over the globe. The French fragrance and beauty company has always held an interest in eye care with its founder, Olivier Baussan, placing Braille on the labels in 1997. A product every year since 2000 has forwarded its profits towards fighting avoidable blindness and the initiative has reached 5 million people over 190 countries and territories so far. L’Occitane has extended their goal to reach 1.7 million children between 2017 and 2019. The product this year is a Solidarity Soap, a shea butter soap that’s delicately scented and fantastic for everyday cleansing. It is wrapped in paper designed by 9-year old artist, Célestin, featuring a pattern of eyes, which highlights the cause. 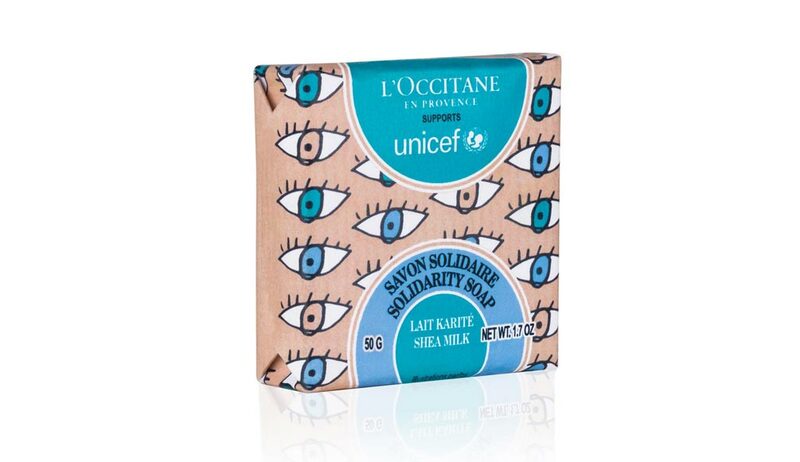 You can find this soap at L’Occitane stores and online to support the prevention of childhood blindness.